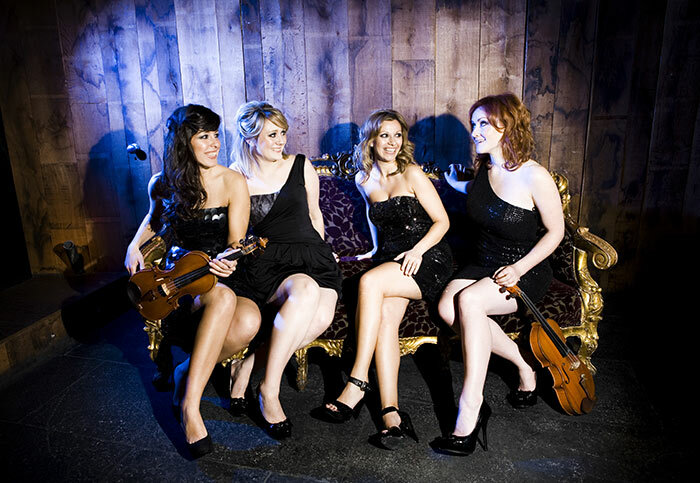 Electrica are an all-female London String Quartet available to hire for weddings, corporate events and private functions. The string ensemble is made up of two violins, cello and viola offering an eclectic repertoire that includes both classical and contemporary, from Bach to the Beatles, from Gershwin to Aerosmith, their set has been carefully put together to cater for everyone's tastes. As well as acoustic background music, the band are also available to hire as an Electric String Quartet, perfect for your live evening entertainment. Their intense 30 minute choreographed show is certain to grab your guests attention creating an evening of glamour and sophistication. If you're looking to hire a London string quartet and would like to find out more, please contact us and the team at Bands For Hire will get back to you within 48 hours. Electrica is made up of only the highest quality musicians, together having performed at prestigious venues such as The Royal Albert Hall, St. James Palace and the Tower of London. Their exceptional level of musicianship is guaranteed to inspire and entertain making them perfect for weddings, corporate events, award ceremonies and private parties. For smaller events, the band are also available to hire as either a string duo or trio. Electrica are a London String quartet for hire in Barking and Dagenham, Barnet, Bexley, Brent, Bromley, Camden, Croydon, Ealing, Enfield, Greenwich, Hackney, Hammersmith and Fulham, Haringey, Harrow, Havering, Hillingdon, Hounslow, Islington, Lambeth, Lewisham, Merton, Newham, Redbridge, Richmond upon Thames, Southwark, Sutton, Tower Hamlets, Waltham Forest, Wandsworth, Kensington and Chelsea, Kingston upon Thames and Westminster. "Last Friday evening, the glamorous Electrica were seen playing and dancing for the launch of the much antisipated opening of the new VZ Art Gallery in Dray Walk Gallery, where pieces by young emerging international artist such as Boris Laurentiev and Natalie Richy were presented"
If you'd like a quote, please click here to send us details about your event and we'll get back to you within 24 hours. Are Electrica a Classical or Electric Quartet? Can you play both at my event? Electrica are available to hire as either a classical string quartet or electrci quartet ,it's entirely up to you. We tailor our set to suit your event so whether you're looking for classical music during the meal, a 30 minute choreographed electric set in the evening, or a combination of the two, just let us know. Do you supply sound system and equipment for your electric show? We can provide full PA system and sound engineer for an additional cost. We are happy to use equipment supplied by the venue/client provided it is suitable for our instruments to ensure a high quality sound and performance. Can we book Electrica as either a solo, duo or trio? We do offer other line-up options for smaller events but please bear in mind that you will get a much fuller and rounded sound with a string quartet. Please also be aware that certain pieces of music may not be possible don't work as well with a duo or trio, we will however do our absolute best to perform your requested repertoire. For classical performances we wear either smart black or jewel-coloured dresses and for the electric shows, black short glam dresses, as seen in the gallery. If you do have specific dress requirements please just let us know. Can we get a quote? If you'd like a quote for your event, please email us with details about the type of performance you're looking for and we'll get back to you with a quote.